Río Piedras: Ediciones de la Universidad de Puerto Rico, 1962. lxii, 190 p. Maps. Was born in the town of Sabana Grande, Puerto Rico daughter of Antonio Cifre Alberti, a native of Mallorca, Spain and of Amanda Amill Negroni, a native of Yauco. 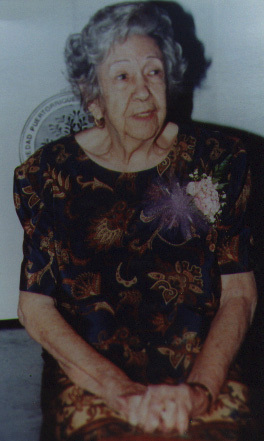 Doña Estela Received her B.A. from the University of Puerto Rico in 1944; a Masters Degree in Political Science with a concentration in History from Columbia University in 1950, and a Doctorate n Philosophy from the University of Madrid in 1958. As a professor in the History Department at the University of Puerto Rico she taught that subject to literally thousands of students over the span of her long career. · La Formación del Pueblo Puertorriqueño - La Contribución de los Gallegos, Asturianos y Santanderinos. de los Catalanes, Balearicos y Valencianos. These books and others were based on primary sources obtained from the major civil, military and ecclisiastical archives and libraies of Spain,the United States, Puerto Rico and several other Latin American nations. She retired from he profesorial duties at the University of Puerto Rico but continued to write until a few weeks before her death it is hoped that her last book on the contributions of the Andaluces will appear in print at some time in the near future. and although death has taken you from us, your light continues to show the way. Puerto Rican-Hispanic Genealogical Society will keep your torch aflame. Para empezar la búsqueda, llene uno de los tres espacios provistos. Enter the surname you are seeking information on in the box above.